BILL RICHARDS, a pilot who flies camera crews in helicopters around New York, on the practices of the helicopter tour company FlyNYON. 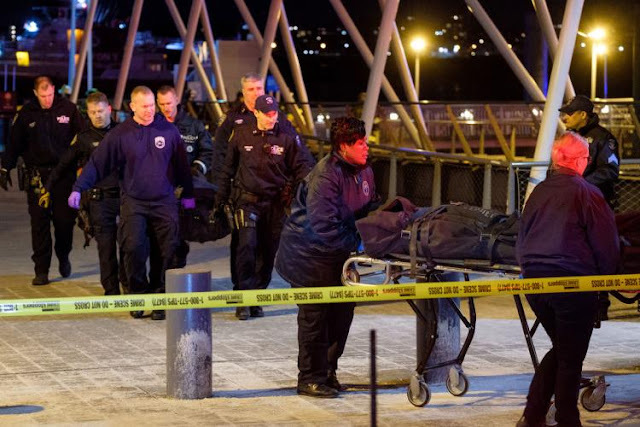 Five people drowned when a FlyNYON flight capsized in the East River last month. 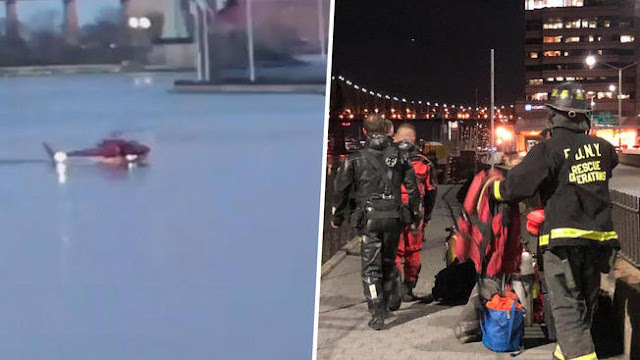 For months before an open-sided helicopter capsized in the East River, drowning five passengers who had been strapped inside, pilots for the company that operated the flight warned their bosses about dangerous conditions, including equipment that could make escape difficult. The pilots repeatedly requested more suitable safety gear, with one pilot writing in an email to company management that “we are setting ourselves up for failure” by using sometimes poorly fitting harnesses. That pilot made a series of recommendations — including one four days before the fatal accident — for new tools that would allow passengers to more easily free themselves in case of an emergency, according to company emails, other internal documents and interviews. The internal documents reviewed by The New York Times indicate that executives for the company, FlyNYON, bristled at the pilots’ concerns, insisting that the operation, which offered the chance to snap selfies while leaning out over the city, was safe. 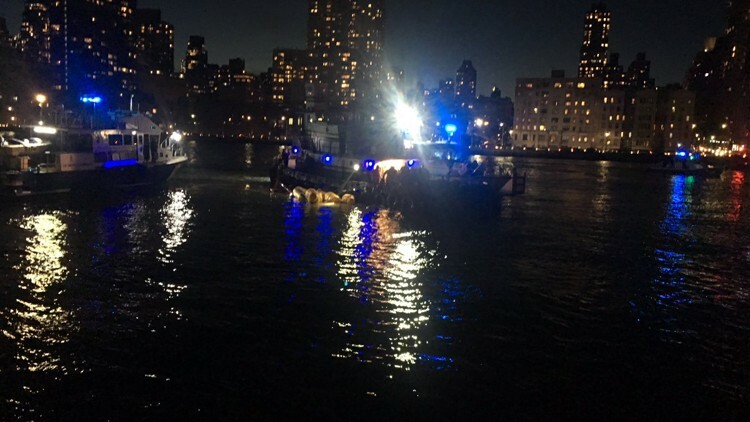 Less than two months after the email exchange, on March 11, a FlyNYON flight splashed in the East River after losing power and quickly rolled over, trapping its pilot and five passengers upside down in the frigid water. 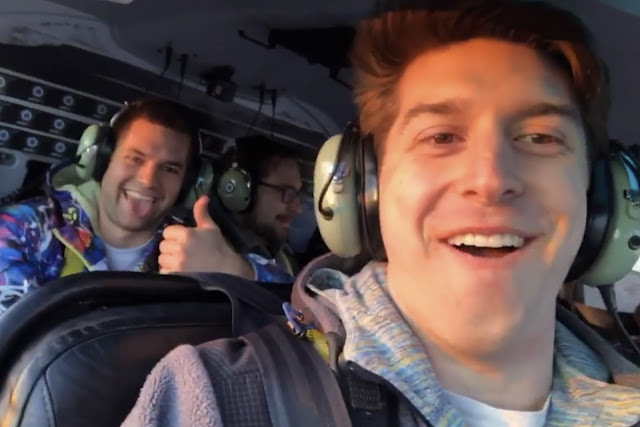 The passengers were outfitted with some of the equipment that the pilots had raised concerns about — yellow harnesses connected to tethers that strapped them into the copter, and small cutters to slice through the tethers so they could free themselves in an emergency. The pilot, Richard Vance, was the only one who was not wearing such a harness; he used a standard seatbelt and was the sole survivor. Mr. Vance told federal investigators that he tried to free the passenger beside him, but the helicopter was submerged before he could finish unhooking the man’s harness, according to a preliminary report. The internal documents, and interviews with people familiar with FlyNYON’s operation and Mr. Vance’s account, paint a portrait of a company that at times appeared to put business concerns ahead of safety concerns as it scrambled to meet surging demand for a daring form of aerial tourism that it pioneered. While government regulations and professional standards had not kept pace, the company claimed on its website that it had developed a proprietary safety system that was the class of the industry. In fact, the documents and interviews show that FlyNYON had been using mostly off-the-shelf construction harnesses that it had planned to upgrade — and that sometimes were supplemented by zip ties and blue painters tape — and tethers that could not be easily severed by the cutters provided. The National Transportation Safety Board is investigating the crash. The Federal Aviation Administration, which had not previously specifically regulated doors-off helicopter flights, has banned any flights that use restraints that passengers cannot quickly get out of, a prohibition aimed squarely at FlyNYON. Multiple pilots who have worked with FlyNYON and Liberty Helicopters — including the pilot who warned of the harnesses in the email — are seeking whistle-blower protections in order to speak out. They have retained a Washington lawyer who specializes in whistle-blower matters, Debra Katz. She has asked the New York attorney general’s office to investigate FlyNYON, and she sent a letter to the F.A.A., claiming that the pilots were subject to retaliation. As a result, she wrote, “there is a pervasive feeling among Liberty pilots that if they provide truthful information to the F.A.A. and the N.T.S.B. and speak out about the lax safety culture and practices at FlyNYON, they will face blackballing in the industry and other forms of career-derailing retaliation.” The New York attorney general’s office has begun a consumer-protection investigation into FlyNYON’s business practices and demanded that the company cease promoting doors-off flights, according to a person who had been briefed on the investigation. The F.A.A. confirmed that it conducted “routine oversight” of Liberty’s operations on Oct. 31 and “observed supplemental harnesses outside a helicopter.” But a spokesman for the agency said that its inspectors would not have rendered judgment on the harnesses because supplemental restraints are not subject to inspection. Liberty Helicopters declined to comment. Like some air-tour companies in other tourist destinations, FlyNYON offered flights on helicopters with the doors open or removed to allow passengers to take unobstructed photographs of the landscape below. But FlyNYON went a step further by putting passengers in harnesses attached to tethers that would let them lean out of — or dangle their legs over — the edge of the cabin. It was an experience that previously had been available mostly to professional photographers, who booked private flights where they were often the only passengers and, therefore, could be more closely monitored by the pilots. Mr. Day and his partners recognized the potential profit in offering such an experience more widely in an era when social media users are willing to pay handsomely for activities that produce thumb-scroll-stopping photos. “Anyone can come up and be an aerial photographer with us,” says one of FlyNYON’s promotional videos. The company encouraged its customers to post shots of their feet suspended over landmarks like the Statue of Liberty or the Empire State Building — images the company called “shoe selfies” — on Instagram and other social media platforms. And remember, its workers requested, to please tag the company in those posts, helping to spread the word about FlyNYON’s service. The social-media strategy was working, drawing more and more people to an industrial section of Kearny, N.J., on the edge of the Port of Newark, from which FlyNYON helicopters depart for flights over Manhattan. New York City officials had prohibited sightseeing tours from flying over land, or flying at all on Sundays. But FlyNYON got around the restrictions by departing from New Jersey and designating its flights as aerial photography missions rather than tours with defined itineraries. Mr. Day boasted in an internal email in February that FlyNYON had defied its doubters, whom he called “dinosaurs,” and had increased its business last year by 400 percent. The company was charging as much as $500 a seat for five-passenger flights lasting 30 to 40 minutes over New York, Miami, Las Vegas, Los Angeles and San Francisco. By December, it was booking as many as 28 flights a day, the emails said. He said at one point he provided a store-bought harness for professional photographers to wear while leaning out of his helicopter. But he abandoned that practice long ago, he said, and has since kept his passengers in their seats or on a camera mount approved by the F.A.A. “Anybody who’s in a helicopter has to have an approved seat” — unless planning to make a parachute jump, Mr. Richards said, citing a specific F.A.A. regulation. The company’s website says “safety has always been our top priority,” and boasts of comprehensive and rigorous passenger safety protocols. But the emails and interviews painted a different picture. Among its claims was the promise of a “proprietary eight-point safety harness system.” A pilot who has worked with FlyNYON said that the company’s most commonly used harness was actually not proprietary at all, nor was it intended for aviation use. Rather, it was merely a yellow nylon construction harness available on Home Depot’s website for $52, which came in only one size. Pilots complained that the harnesses were too big to properly fit smaller customers, including many women and children, according to the emails. They show that FlyNYON staff members were instructed at one point to use zip ties to achieve a tighter fit. And to keep those harnesses and passengers’ seatbelts from unbuckling accidentally in flight — which would not have released the harnesses completely — FlyNYON staffers often used tape that Mr. Day referred to as “NYON blue safety tape,” according to three pilots who have worked with FlyNYON. But the “safety tape” was just common painters’ tape, said the pilots, one of whom wrote the email warning about the harnesses and is among those being represented by the whistle-blower lawyer. The pilots requested anonymity because of fears of retaliation and because they did not want to jeopardize employment in the close-knit helicopter community. The three pilots said FlyNYON brushed aside many of the concerns they did raise, though the company did make some changes based on their complaints. According to emails and interviews, pilots preferred a different model of harness that could be adjusted to fit passengers of varying sizes without the use of zip ties. The harnesses, which were blue, were considered safer partly because they connected to the tethers in a place that passengers could more easily reach to try to detach themselves. And the blue harnesses were approved by the F.A.A. for some uses, though not specifically open-door helicopters flights, which had not been explicitly addressed in F.A.A. rules. At the time of the crash, the company had only a few blue harnesses in use. Likewise, the company’s pilots raised concerns about the tethers used to secure the passengers, via their harnesses, to the interior of the helicopters. It was difficult for passengers to reach the point at which the tethers fastened to their yellow harnesses, and, even if they could reach the connection, it would be difficult for them to disconnect the carabineers that connected the tethers to the harnesses on their own, according to the pilots who worked with FlyNYON. So each passenger was provided a hook-shaped blade, marketed as a seatbelt cutter, that they were instructed to use to sever the tether in case of an emergency that required them to extricate themselves. A safety video played for passengers before they went on trips showed people using the cutters to easily slice through the tethers, according to people who viewed it. But the tethers in the video were not the same ones being used by FlyNYON. And when employees tested the equipment that was in use in November, they found it extremely difficult to sever the tether using the cutter, according to the former FlyNYON official. On March 7 — just four days before the crash — the company planned to discuss a “final decision” on the new tethers and cutters, according to the emails. It is unclear if FlyNYON purchased the new equipment, but, even if it did, the new tethers and cutters were not deployed on the fatal March 11 flight. Instagram videos posted by the passengers before liftoff show them wearing the yellow harnesses. A preliminary report by the N.T.S.B. indicated that the pilot, Mr. Vance, told investigators that he had “pointed out where the cutting tool was located on their harness and explained how to use it” before taking off. While hovering over Central Park, he told them, the single-engine helicopter, an AS350 B2 model made by Airbus, suddenly lost power. When he reached down to cut the flow of fuel as he prepared to put the aircraft down in the river, he saw that the fuel cutoff lever had been tripped and the tether of his front-seat passenger was under it. That observation suggested that the passenger’s movement may have caused the crash, though federal investigators have not reached a conclusion about the cause. 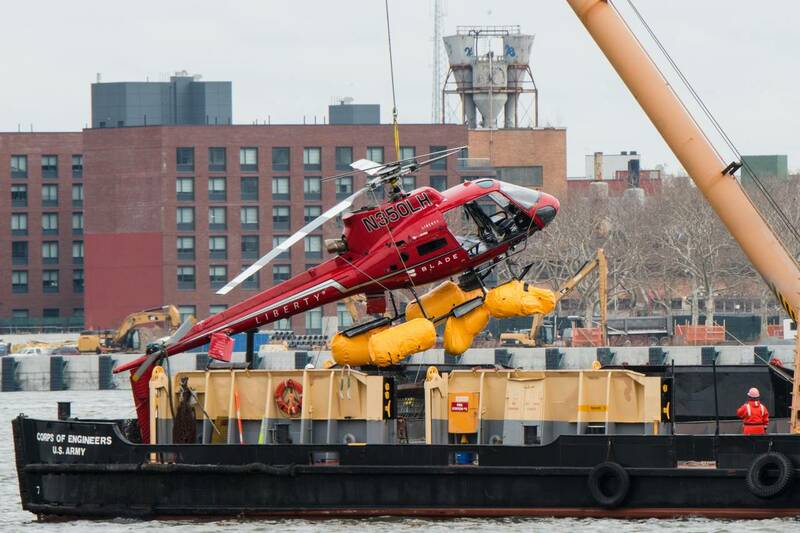 On March 11, 2018, about 1908 eastern daylight time, an American Eurocopter Corp (Airbus Helicopters) AS350B2, N350LH, was substantially damaged when it impacted the East River and subsequently rolled inverted after the pilot reported a loss of engine power near New York, New York. The pilot egressed from the helicopter and sustained minor injuries. The five passengers did not egress and were fatally injured. The scheduled 30-minute, doors-off aerial photography flight was operated by Liberty Helicopters, Inc., on behalf of FlyNYON under the provisions of Title 14 Code of Federal Regulations (CFR) Part 91. Visual meteorological conditions prevailed, and no flight plan was filed for the flight, which originated from Helo Kearny Heliport (65NJ), Kearny, New Jersey about 1900. 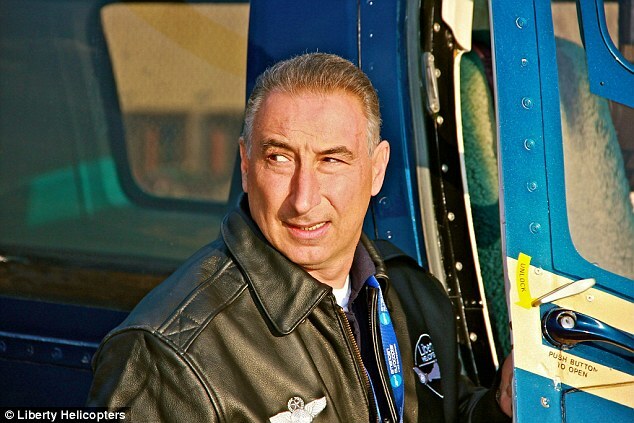 According to the pilot, after he arrived at 65NJ on the day of the accident, he performed a preflight inspection of the helicopter and made sure it was fueled. The first group of passengers from FlyNYON was scheduled to arrive at 1100. The pilot then completed multiple 15- to 30-minute flights that day but could not recall how many. About 1845, he received a text message from FlyNYON operations personnel scheduling the accident flight. When the FlyNYON van arrived, the pilot checked his passengers' harnesses and put their life vests on. He pointed out where the cutting tool was located on their harness and explained how to use it. He then seated the passengers and secured their harness tethers to hard points on the helicopter. After the passengers were seated, loading personnel assisted them with putting on the helicopter's restraints (For the purpose of this report, "restraint" refers to the seabelt and shoulder harness installed by the helicopter manufacturer, and "harness" refers to the system provided by FlyNYON). Before he started the helicopter, the pilot provided a safety briefing that included which of the passengers was going to remove their restraints and which would remain buckled in their restraints during the flight. He asked the passengers to confirm what sights they wanted to see, and they put their headsets on. He finished the safety briefing and again explained how to use the cutting tool to cut the seatbelts. He told them where the fire extinguisher was and told them that if there was an emergency he would tell the passengers to get back into their seats. He confirmed their points of interest and did a communications check through the headsets. The passengers could hear him and radio traffic, but they did not have microphones and could not speak to the pilot or each other. 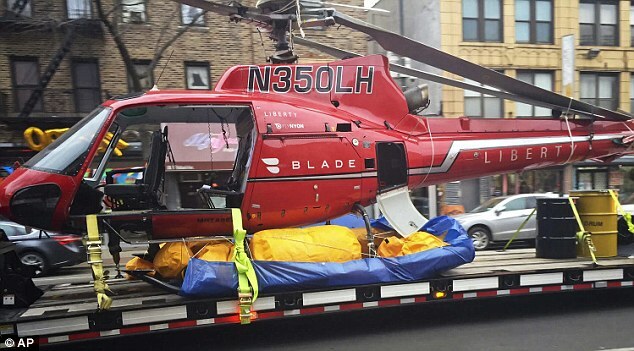 Shortly after starting the helicopter's engine, the pilot departed behind two other helicopters and began heading toward the Statue of Liberty at an altitude of between 300 and 500 ft above ground level (agl). During flight, the outboard passengers (left front, left rear, and right rear) stayed in their seats and restraints but turned sideways (outboard) to take photographs. The inboard passengers removed their restraints but remained tethered in their harnesses and sat on the floor with their feet on the helicopter's skids. They flew at 500 ft to the Brooklyn Bridge before continuing up the East River to Central Park. 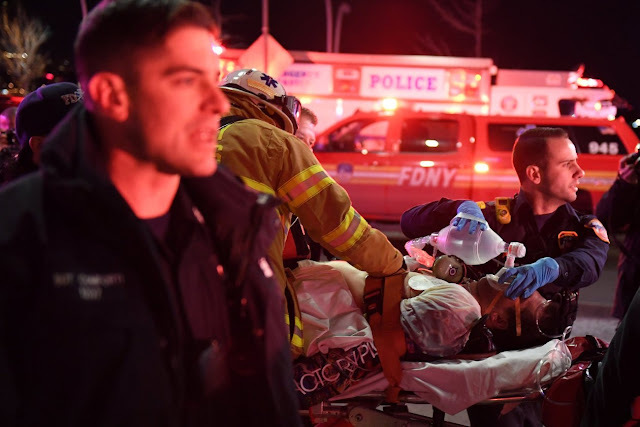 The pilot contacted LaGuardia Airport air traffic control, and the controller provided the pilot with a transponder code and advised him to stay south of the extended centerline of runway 22. He requested to fly at 2,000 ft and began a shallow climb while the left side passengers took photographs of midtown Manhattan. As the helicopter neared the eastern boundary of Central Park, the pilot slowed the helicopter to between 20 and 30 knots groundspeed so the passengers could take photographs. At this point, he noticed that the front passenger's restraint was hanging from the seat. He picked it up, tapped the passenger, and told him to put it back on, which he did. During the interview the pilot also recalled that other passengers had inadvertently released their seatbelts during previous flights. As they were flying along the eastern side of Central Park, the front seat passenger turned sideways, slid across the double bench seat toward the pilot, leaned back, and extended his feet to take a photograph of his feet outside the helicopter. As the pilot initiated a right pedal turn to begin to head south, the nose of the helicopter began to turn right faster than he expected, and he heard a low rotor rpm alert in his headset. He then observed engine pressure and fuel pressure warning lights and believed he had experienced an engine failure. He lowered the collective pitch control to maintain rotor rpm and let the nose continue to turn to the right. Central Park came into view and he briefly considered landing there but thought there were "too many people." 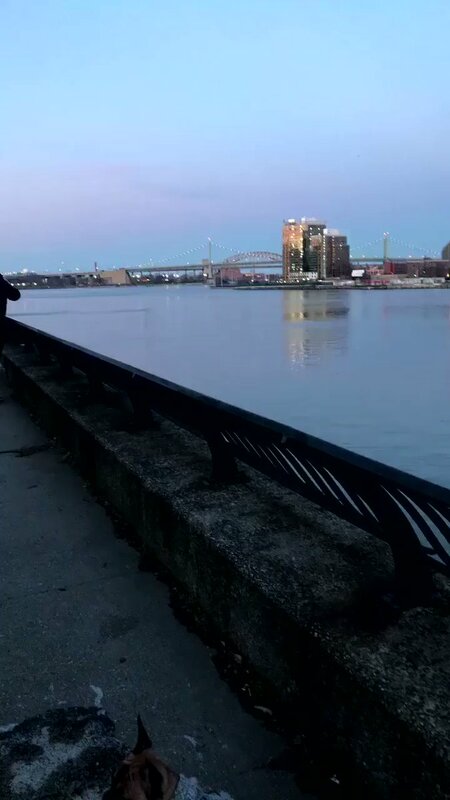 He continued the turn back toward the East River and made his first distress call to air traffic control. He yelled to the passengers to get back in their seats. Due to the helicopter's airspeed, he was not sure he could make it to the East River and reduced rotor rpm so he could "glide better." Once he was in an established autorotative glide, he attempted to restart the engine but was unsuccessful. He waited 1 or 2 seconds and tried the starter again, but there were no positive indications of a successful engine restart on the instrumentation. 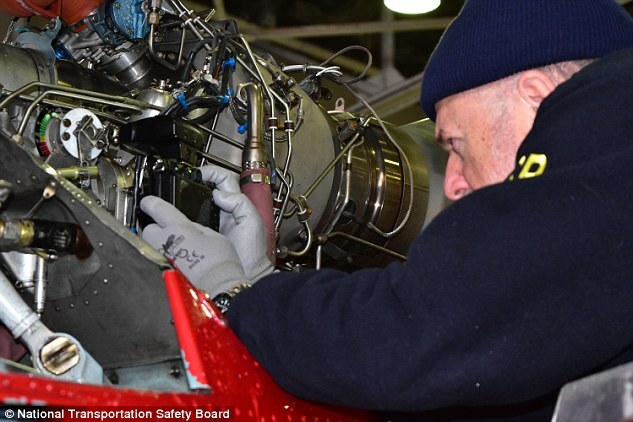 He checked the fuel control lever and found that it was still in its detent for normal operation. When he was sure he could clear the buildings and make it to the river, he activated the floats at an altitude of about 800 ft agl. At this point he was "committed to impact," and, when he reached down for the emergency fuel shutoff lever, he realized that it was in the off position. He also noted that a portion of the front seat passenger's tether was underneath the lever. As the helicopter continued to descend through 600 ft agl, he positioned the fuel shutoff lever to the "on" position and attempted to restart the engine. He observed positive indications on the engine instruments immediately. As the helicopter descended through 300 ft, he realized that the engine "wasn't spooling up fast enough," and, given the helicopter's proximity to the surface, he had to continue the autorotation. He again reached for the fuel shutoff lever and positioned it back to "off." Passing through between 100 and 50 ft, he began the cyclic flare in an extended glide configuration, but he "did not get a lot of rpm back." He performed a flare reduction at 10 to 15 ft. He pulled the collective pitch control up "as far as it would go." The helicopter then impacted the water at 5° to 10° nose-up attitude. After impacting the water, the chin bubble on the pilot's side began to fill with water, which quickly covered the floor. He kept his restraint on and reached down for the front seat passenger's carabiner attachment to the helicopter. He turned the knurled screw "two or three rotations"; by that time, the helicopter was "listing past a 45° roll." He then decided to egress the helicopter, and by the time he unbuckled his restraint, he was fully under water. He used two hands to grab the door frame and pull himself out. He surfaced about 4 ft away from the nose of the helicopter and crawled up onto the belly. He stood up and waved for help but could not see anything. 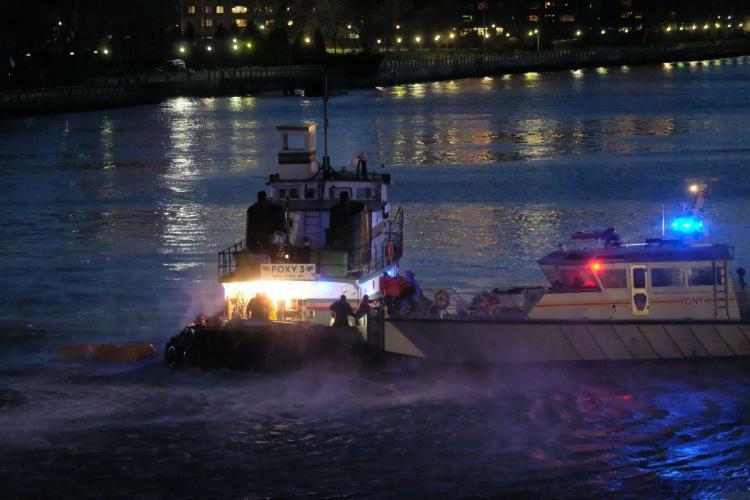 A tugboat was the first vessel to arrive at the accident site, and the crew began to render assistance. First responders later arrived, and subsequently extricated the five passengers from the helicopter. The helicopter remained submerged in an inverted position in the East River for about 18 hours before it was recovered at slack tide the following day. Examination of the helicopter revealed that it had been substantially damaged during the impact sequence. Continuity of the flight controls was observed between the cyclic, collective, main rotor servos, and the main rotor head. The cyclic, collective, and pedal control tubes underneath the cockpit floor remained intact. No evidence of blockages or foreign object debris was observed on the engine air inlet barrier filter. Continuity of drive was confirmed between the engine power turbine and the main rotor head. The red main rotor blade remained attached to its respective sleeve and was fractured chordwise about 4 ft from the main rotor blade attachment bolts. The blue and yellow blades were attached to their respective sleeves and were damaged. All three-main rotor blade pitch change links remained attached at their respective pitch horn and rotating swashplate. The vibration absorber remained installed on top of the main rotor head. Both tail rotor blades remained attached to their hub. One tail rotor blade exhibited a chordwise fracture about 6 inches from its root end. The pitch link of this blade was bent near the outboard rod end. The second tail rotor blade was generally intact, and its pitch links did not exhibit deformation. Rotation of the tail rotor resulted in rotation of the aluminum tail rotor drive shaft's forward riveted connection, but the shaft rotated within the external splined adapter. The external splined adapter remained connected to the internal-splined [flange] adapter and was continuous through the steel tail rotor drive shaft to the tail rotor drive output flange to the engine reduction gearbox. There was no evidence of binding when manually rotating the tail rotor drive. The fuel flow control lever was found in the off position. The fuel shutoff lever was found in the open position. The snapwire (witness wire) between the fuel shutoff lever and the engine control housing was broken at its lower end where it was normally secured through a hole in the control housing. The collective stick was in its normally installed position. The collective position was nearly full down. The collective friction lock was able to be rotated by hand. The cyclic stick was in its normally installed position. The cyclic position was found to be aft right. The cyclic friction lock was able to be easily rotated by hand. The collective lever lock was in its stowed position on the center console. Both pedals were found in their normally installed position. The right pedal position was nearly full-forward with a corresponding aft position of the left pedal. The pedals could not be manually actuated. A portable fire extinguisher was found loose in the front-right chin bubble. Examination of the engine revealed that the engine was still mounted in the helicopter and the cowling was intact. There were no signs of oil or fuel leaks, fire, or uncontainment. The exhaust duct was intact and undamaged. The power turbine wheel could be rotated easily, but only in the free-wheeling direction, which was consistent with internal continuity as well as an intact and operating rotor clutch. The trailing edges of the power turbine blades were examined through the exhaust duct and were all present and undamaged. The gas generator (GG) spool was accessed by reaching into the air inlet duct and turning the axial compressor wheel. The GG spool could be rotated easily by hand; however, a faint scratching noise could be heard from the core, consistent with corrosion due to salt water contact on the shaft bearings. The four magnetic oil chip detectors were removed and found absent of debris. The oil filter bypass indicator was not triggered indicating no blockage in the oil filter. The fuel supply line from the firewall to the fuel pump was disconnected at the firewall fitting and fuel was observed to drain from the line. Examination of the emergency float system revealed that the three floats installed on the left landing gear skid appeared to be more inflated than the floats on the right landing gear skid. The emergency floats' left pressurized gas cylinder gauge indicated about 0 psi, while the right pressurized gas cylinder gauge indicated about 4,000 psi. A functional check was performed by actuating the cyclic trigger (which is what is used to activate the floats). The trigger mechanism was smooth with no evidence of binding. Continuity of the float system control was established between the trigger, dual cable block, and the activation cable clevis connection. When the trigger was released, the dual cable block returned to its normal position (via spring within the junction box) but the upper and lower turnbuckles remained in their actuated positions. 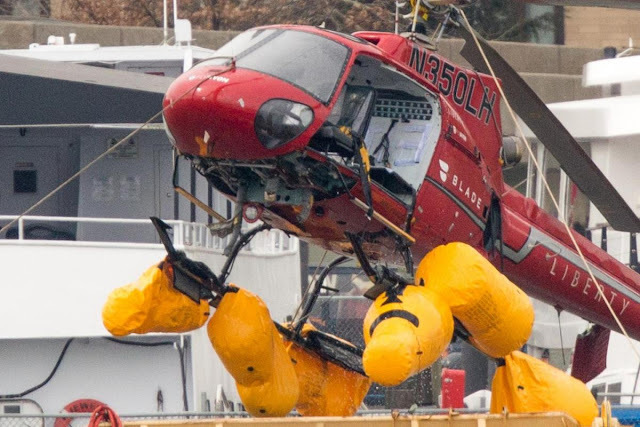 Examination of the seats and restraint systems revealed that the five passengers onboard the helicopter were provided with airframe manufacturer-installed restraints, as well as a full body harness. The harness system was not installed by the helicopter manufacturer and was comprised of off-the-shelf components consisting of a nylon fall-protection harness that was attached at the occupants' back by a locking carabiner to a lanyard. The lanyard was composed of multiple woven fabric loops, and the opposite end of the lanyard was secured by another locking carabiner to a hard point on the helicopter. A small pouch was attached to the harness and contained a cutting tool. Under normal circumstances, at the end of each flight, FlyNYON personnel would unscrew the locking carabiner located on the back of the passengers' harnesses so that the passengers could egress. New York (CNN) You're soaring 2,000 feet above Manhattan's sparkling East River, the distant skyline glistening at dusk as your feet dangle from the side of a whirring doors-off helicopter. "It feels like when you are on top of the world," Judith Verweijen, of the Netherlands, said of her recent flight. "You don't think about fear. You think about the joy ... that you're able to do that." That aura of invincibility shattered last Sunday evening -- one day after Verweijen's excursion -- when a helicopter booked by the same firm she flew with splashed into the East River. Five passengers drowned, unable to break free from harnesses meant to prevent them from falling out. The pilot escaped. It was the deadliest crash involving a national doors-off helicopter tour. Experts say the industry runs with scant oversight, even as its popularity surges in step with the desire -- especially among millennials -- for breathtaking, unobstructed photos to post on social media. "This accident has the potential to be a watershed event for the industry," said Peter Goelz, a former managing director of the National Transportation Safety Board. "There are clear questions about whether this type of operation was appropriately overseen by the FAA and others." In light of the fatal crash, the Federal Aviation Administration on Friday issued an order suspending "doors off" flights involving "restraints that cannot be released quickly in an emergency." 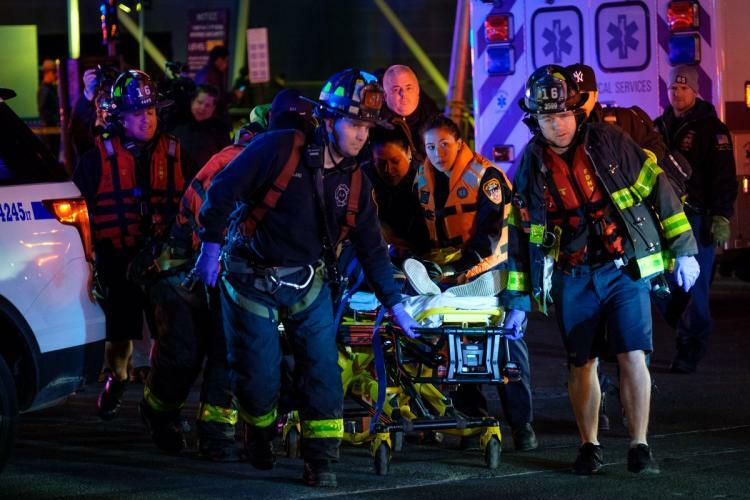 "Operators, pilots, and consumers should be aware of the hazard presented by supplemental restraint devices in the event of an emergency evacuation during 'doors off' flights," the statement said. "The FAA will order operators and pilots to take immediate actions to control or mitigate this risk." 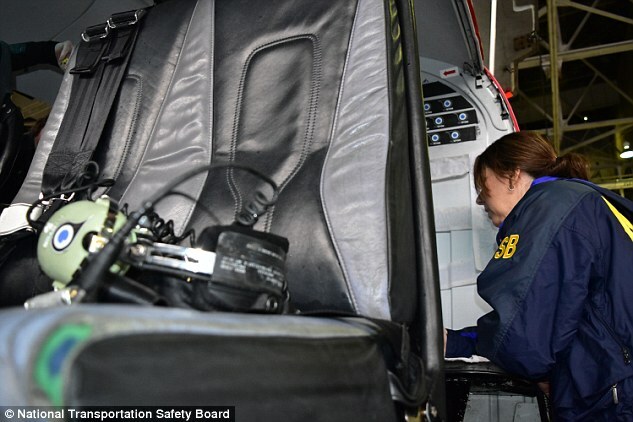 With its mandate, the agency seems to have keyed in on a critical difference between doors-off flights, which strap in passengers with harnesses, and traditional helicopter tours, which use seat belts. While a harness might seem safer to untrained thrill-seekers who want to snap a "shoe selfie" to pin on Instagram or Facebook, they also can prove harder to escape in an emergency. The order affects "several dozen" national helicopter tour companies offering doors-off flights, FAA spokesman Gregory Martin told CNN. Tours from major cities to the Grand Canyon to remote scenic locations on the Hawaiian Islands are affected. All operators must be certified by the FAA. The agency said it also was conducting a top-to-bottom "review of its rules governing these flights to examine any potential misapplication that could create safety gaps for passengers." 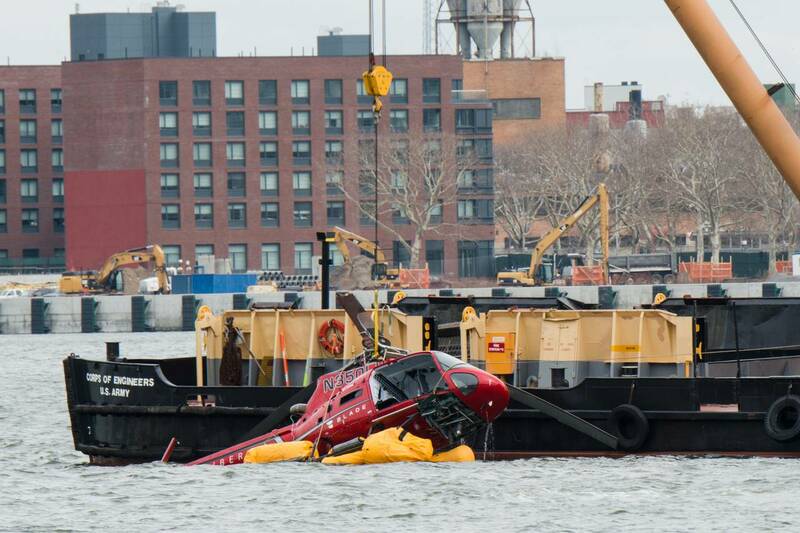 Meantime, US Sen. Chuck Schumer of New York has called on the FAA to suspend the operating certificate of Liberty Helicopters, which provided the aircraft that crashed, until the company's safety record and the cause of the accident are fully assessed. Martin said FlyNYON, the tour company that hired Liberty, has suspended its doors-off flights, but the company did not respond to multiple requests for comment. The FAA conducts on-site visits as well as reviews of maintenance and safety records with a limited number of inspectors, Martin said. "You have inspectors that also have air carriers with hundreds of flights a day carrying hundreds of people," he said. "So there's a risk-based approach there versus very limited and specific operations for these helicopters." 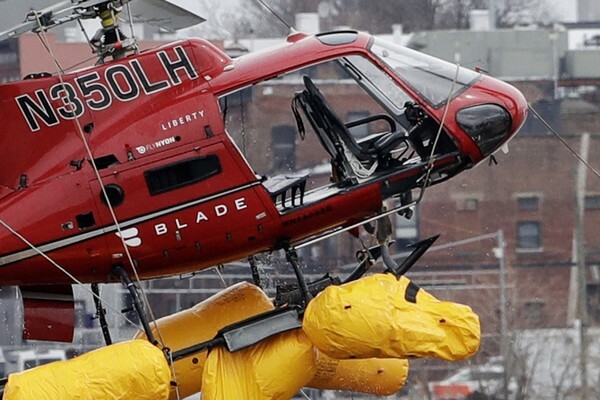 The NTSB said last week it had interviewed Liberty Helicopters' personnel, including the pilot, adding that the helicopter's engine showed "no evidence of abnormalities." The crash was Liberty Helicopters' third in the past 11 years. Investigators are scrutinizing the harnesses. 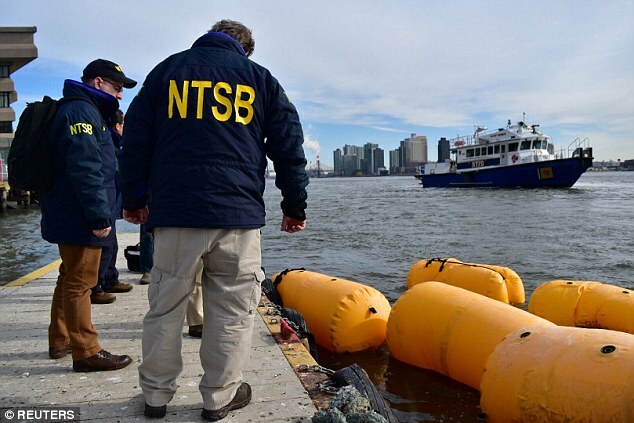 They also are inspecting the helicopter, its flotation devices, the weather and other factors, the NTSB said. FlyNYON said it was fully cooperating with the FAA and NTSB investigation, according to a Twitter statement. Since the crash, the companies have referred CNN's requests for comment to federal agencies. The FAA action comes after years of warnings by experts who have predicted that lax rules governing the commercial air tour industry could invite a deadly wreck much like the one in New York. Aviation experts have pointed to specific dangers inherent to commercial air tours. Last week's flight was conducted under Part 91 of FAA regulations as a commercial flight for "aerial photography," which apply to air tour operators that take off and land at the same airport and stay within 25 miles of that airport, Martin said. Companies governed by Part 91 have "less stringent operations, maintenance, and training specifications" and are more likely to crash than other commercial air operations, according to a 2014 study for the National Institutes of Health by Navy flight surgeon Sarah-Blythe Ballard. "The Part 91 air tour crash rate of 3.5 per 100,000 (hours) flown is similar to the reported crash rates in categories considered to be 'high hazard' commercial aviation," said the study, referring to operations such as emergency medical flights and transport to off-shore drilling sites. Part 91 tour aircraft have less stringent flight-duty-time and rest requirements as well as lower pilot qualification standards, according to another study by the same author. Aviation experts and the NTSB have long recommended elimination of the "25-mile exception," which allows flights without stricter FAA flight data monitoring and pilot-training required of other commercial operators to fly within 25 nautical miles of the departure airport, the study said. But the FAA said in 2007 -- the last time the regulation was amended -- that many companies operating under the exception would "go out of business" if the rule were eliminated, according to an agency report on its National Air Tour Safety Standards. "The FAA believes there are other alternatives to achieve satisfactory safety goals, minimize impact on the industry, and still increase the level of safety, rather than eliminating the 25-mile exception," said the agency, referring to requirements for pontoons on over-water flights and briefings on emergency landings, water ditching, and the use of seat belts and life preservers. The rules were created "at a time that didn't comprehend that every person would have a cellphone with a panoramic feature recording device or GoPro cameras," Martin said. They applied almost exclusively to professional photography and survey work. "So you didn't want to limit very specific and unique type of operations with the same level of oversight that would apply to flights carrying dozens or a hundred-plus people," he said. Today, those rules are being revisited. "Certainly you've seen new revenue opportunities for some of these operators," Martin said. "In the case of this flight -- to take people up and have them shoot panoramic scenes with their iPhones." The level of instruction offered to helicopter tour passengers on escaping safety harnesses has also come into question. The FAA requires all over-water commercial air tour operations to conduct preflight safety briefings "on procedures for water ditching, use of required life preservers, and emergency exit procedures in the event of a water landing." There is no requirement to specifically instruct passengers on escaping harnesses during an emergency. Verweijen, the woman who took a FlyNYON tour the day before the crash, told CNN she works in the offshore oil and gas industry and has regularly flown over water in a helicopter. She said bailing out of a sinking aircraft requires practice and expertise. "In my opinion, it is nearly impossible for a non-trained passenger to escape," said Verweijen, who has received helicopter underwater escape training. "You completely lose the orientation." A 2014 study on helicopter crashes into water, published in the journal "Aviation, Space, and Environmental Medicine," said reports of such accidents showed "the principal cause of death was drowning from failure to escape due to disorientation." The reports showed that helicopters making water landings typically sink rapidly and flip over. The journal article recommended increased training emphasizing the lack of warning in accidents, underwater escape maneuvers and post-crash survival in the water. "It is dark, cold and you cannot see anything," Verweijen said. "The pilot could get out because he was trained." Passengers who took flight with FlyNYON prior to the crash said they were shown brief safety videos. One shared the video with CNN. The three-minute video devotes about 20 seconds to how to get out of what the company calls its "proprietary 8 Point Safety Harness System" during an emergency landing. "In the rare case of an emergency, the harness can be released by opening the quick-release clip in the back of the harness," a voice on the video says. A curved cutter located on the harness' shoulder strap can also be used to cut through the strap, according to the video. There was no mention of how to escape a sinking helicopter, or the disorientation that is common as the aircraft goes underwater rapidly and, many times, turns upside down. After the crash, police and fire department emergency divers, in frigid waters, discovered that the safety harnesses had become death traps. The pilot escaped, but his five passengers died from accidental drowning. FlyNYON offers its "doors off helicopter photo experience" in New York, Las Vegas, San Francisco and Los Angeles, promising to make "professional aerial photography services accessible to everyone," according to its website. A promotional video offers stunning views of the city, with two young women in heels and a young man in plaid shorts and sneakers with legs dangling from a helicopter dancing over the East River to music worthy of a Hollywood movie trailer. "You're looking down at the city that never sleeps," the company website says of the 15-minute "New York experience" flight. "Trying to take it all in. Dangling your feet for a #shoeselfie." The experience isn't cheap. FlyNYON's 11 flight offerings in the city range from $99 to $2,000 for online bookings. 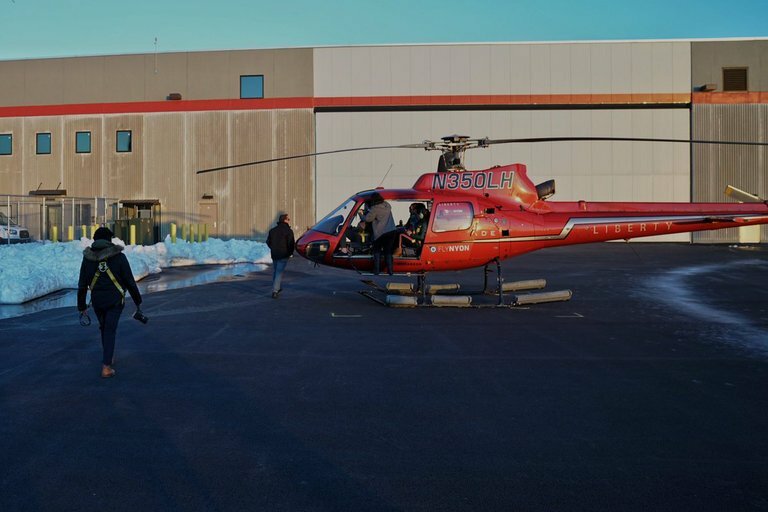 In New York alone, the helicopter tour industry contributes $50 million a year to the local economy and employs more than 200 people, according to the Helicopter Tourism and Jobs Council. Last week's deadly crash, though, could change that. "I realize you get a good picture if you have a door open but the door-open rule was put in for ... commercial aerial photography, not for tourists," Goelz said. "The NTSB is going to look very closely at this whole harnessing system and the process of approving it." The Federal Aviation Administration has ordered helicopter operators to suspend “doors off” flights that require passengers to wear difficult-to-release harnesses. 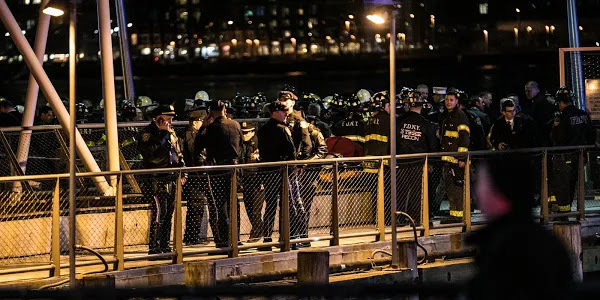 The order comes days after a crash in New York City when a helicopter on such a flight made an emergency landing on the East River and rolled over. The five passengers who were wearing harnesses drowned. Only the pilot escaped. “Operators, pilots, and consumers should be aware of the hazard presented by supplemental restraint devices in the event of an emergency evacuation during ‘doors off’ flights,” the FAA said in a statement Friday. The FAA said that helicopter operators must suspend the use of such harnesses until ways can be found to mitigate risks posed by restraints that can’t be released quickly in an emergency. The agency also said it would review its policies on such flights to see if there are other “safety gaps” for passengers. Doors-off flights, which have gained in popularity, offer unencumbered views and are popular for photography, but they require the complicated safety harnesses. The parents of one of the victims of the crash, 26-year-old Trevor Cadigan, have filed a lawsuit against Liberty Helicopters, of Kearny, N.J., saying it was “grossly negligent and reckless” for placing him in a harness from which it was difficult to escape. The National Transportation Safety Board is investigating the harnesses. 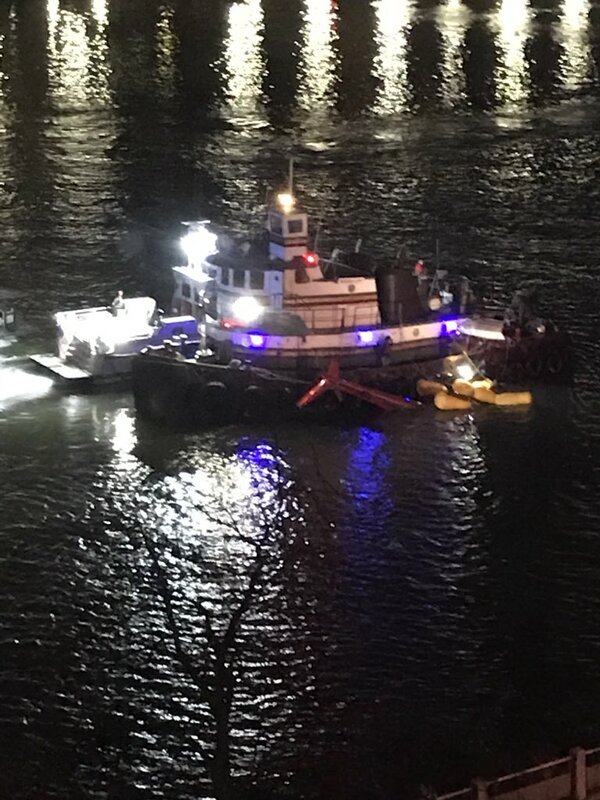 It is also probing why the helicopter was forced to land on the river and why its inflatable pontoons didn’t keep it from rolling over. So far, investigators found nothing wrong with the helicopter’s engine or flight controls before the crash. Despite high-profile government and industry safety initiatives, both the total number and frequency of serious U.S. helicopter crashes have remained stubbornly high in recent years. Last year, the overall fatal-accident rate in the U.S. for all helicopters inched higher, compared with the two previous years, according to preliminary data from the industry and the FAA. 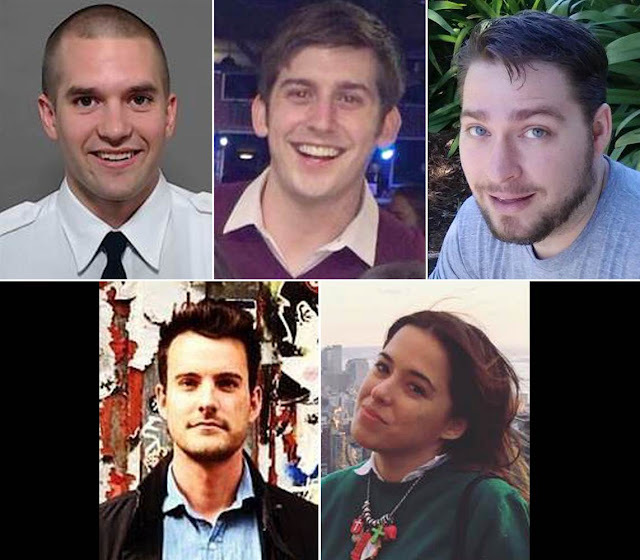 Possible dangers of sightseeing flights also came under scrutiny last month, when a helicopter crashed and burned on a tour of the Grand Canyon, killing five British tourists and severely injuring the pilot and a passenger. Stretching back several years, the FAA has taken action to improve the survival rate in helicopter crashes by requiring sturdier seats and more fire-resistant fuel systems. ​NEW YORK (March 15, 2018)—The National Transportation Safety Board continued its investigation Thursday into the March 11, 2018, accident in which an Airbus Helicopters AS350B2 (N350LH) impacted New York’s East River. 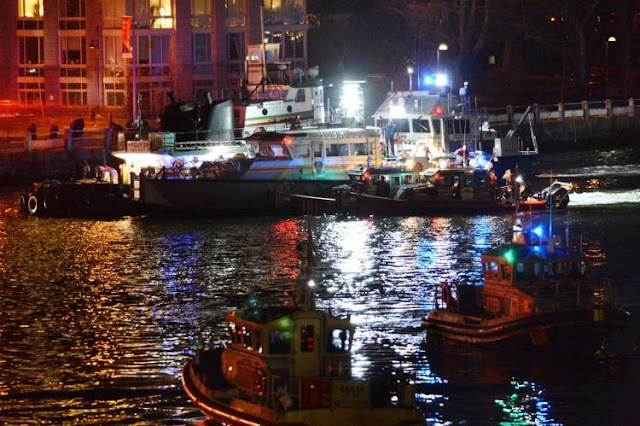 The helicopter was substantially damaged when it hit the water and subsequently rolled inverted during an autorotation, killing five passengers and injuring the pilot. NTSB investigators are seeking videos that show different angles or aspects of the accident sequence. Broadcasters or witnesses with video are asked to contact the NTSB at witness@ntsb.gov. 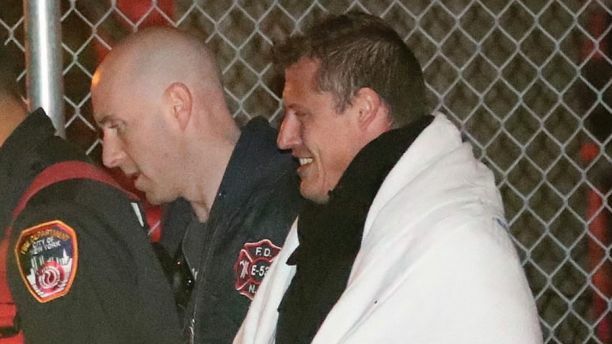 The pilot of the helicopter, Richard Vance, after emerging from the frigid waters of New York City's East River. Tickets on the flight were sold by FlyNYON and the helicopter was operated by Liberty Helicopters. Attempts to reach the companies for comment have been unsuccessful. A statement on Liberty’s website said it was "fully cooperating” with investigations into the crash. The chief pilot for the company whose helicopter crashed Sunday in the East River — killing all five passengers — spent more than eight years behind bars for repeatedly stabbing a woman during a Long Island robbery, The Post has learned. Paul Tramontana admitted covering his victim’s face with a pillow and plunging a knife through it during the bloody, 1982 assault in Brentwood — which was spurred by his cocaine habit, court records show. “Whether I penetrated the pillow or not I can’t say, but I did try to stab her through the pillow,” Tramontana admitted while pleading guilty to second-degree attempted murder. The chairman and CEO of Liberty Helicopters, Drew Schaefer, 56, has his own skeletons in his closet: alleged stock scams that got him barred from the securities industry, records show. While CEO of since-shuttered Americorp Securities, Schaefer solicited aftermarket orders ahead of a 1994 initial public offering and delayed purchase orders so he could sell shares to his customers at higher prices, the Securities and Exchange Commission alleged. He agreed to fork over $200,000 of his ill-gotten gains in a 1997 deal with the SEC that ended his Wall Street career. New Jersey court records show that Schaefer also was accused in 2003 by partner Alvin Trenk of diverting corporate assets of Liberty’s parent company, Sightseeing Tours of America, for his own use. The case was settled. Trenk currently sits on Liberty’s board of directors, according to the company’s website. Liberty has come under fire since Sunday night’s tragedy, in which the passengers drowned while tethered into the cabin of the chopper chartered by ­FlyNYON for a “doors-off” photography flight. Only pilot Richard Vance survived. The accident followed at least four others involving Liberty helicopters, including a midair collision with a private plane that killed nine people in 2009. Tramontana, 56, who was paroled in 1990, was at the controls when a charter flight crashed in New Jersey in heavy fog in 2001. Everyone survived. Tramontana’s criminal record didn’t keep him from obtaining a pilot’s license because the FAA disqualifies only ex-cons whose convictions involve drugs or alcohol. 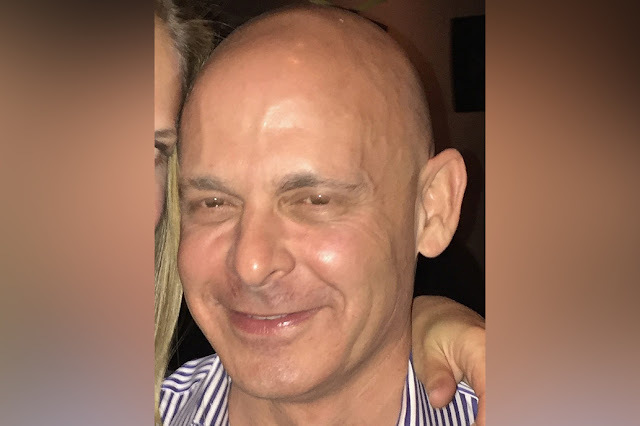 Tramontana and accomplice Michael Basile scammed their way into Ettl’s home believing “there was a sum of $40,000 in there at the time,” Legal Aid lawyer Robert Kenny said. Ettl’s husband, the late Albert Ettl, told the judge that his wife suffered horribly during and after the April 14, 1982, attack that left her hospitalized for six weeks. “She will never forget these men who dragged her from room to room, screaming at her to hand over her money, and repeatedly stabbing her,” Albert wrote in a letter opposing any leniency. The impact looked survivable but only the pilot extricates himself. No doubt they'll be looking at what sort of passenger briefing was given regarding use of the harnesses and egress of the aircraft. Cold water, panic and darkness, all factors I'm sure. There was also some speculation as of late about a a strap getting caught on a fuel shutoff valve. 5 passengers with gear plus a pilot. I don't fly helicopters but that seems like a lot crammed into a small cabin. What a terrible tragedy. 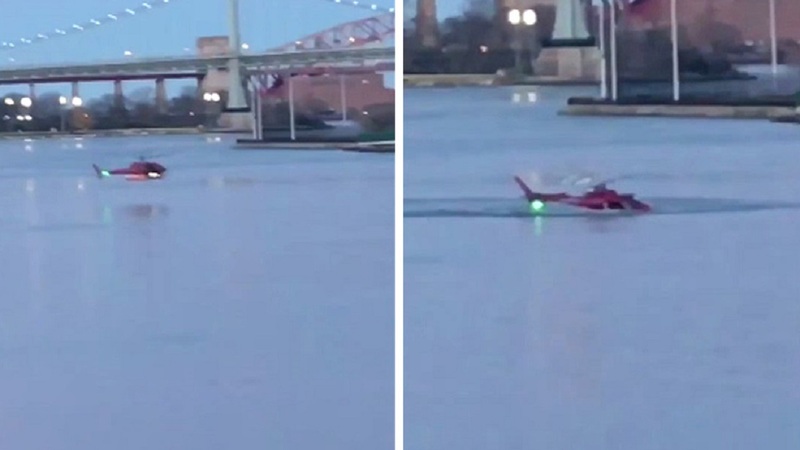 After watching the video with the helicopter doing an autorotation landing in the water, I'm amazed that anyone died. 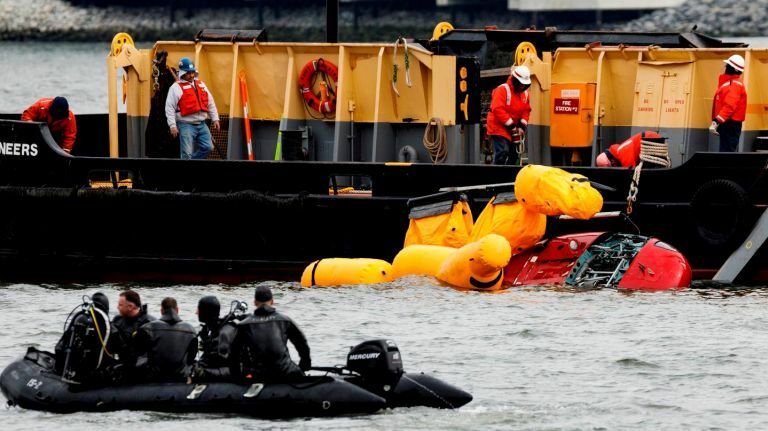 Apparently the passengers were not able to unharness and drowned. 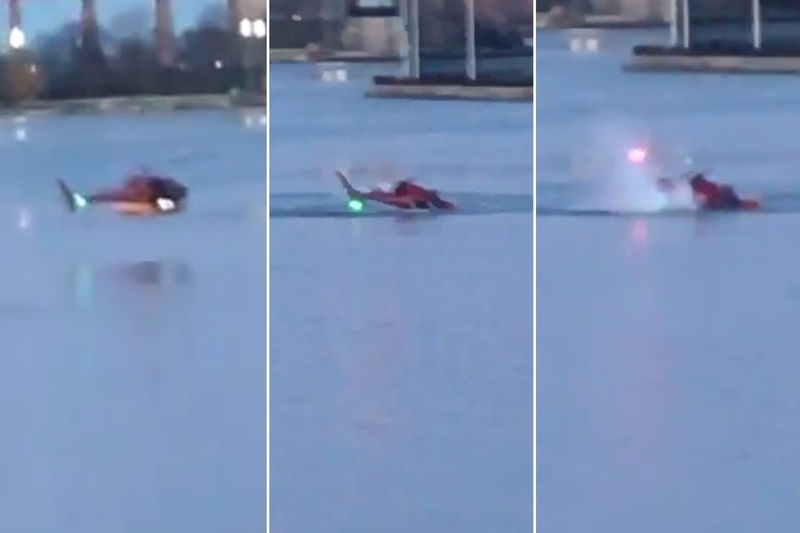 I am a commercial rotorcraft pilot but have never had training or experience on full auto water landings. But it’s well known in the biz that the emergency pop out floatation systems are far from perfect in keeping the ship upright. A helicopter has a high center of gravity, and it’s more diffucult than people imagine to keep it from rolling over even in calm water. The FAA only requires full landing power off autos from Rotor CFI candidates I believe. I think the A Star requires a little aft and right cyclic for autos, and that ship did roll right. It’s all very sad, they were young people with lots of life ahead. Also, those passengers should have been able to quickly un buckle and get at a door. Airbus must know the A Star can quickly roll over, even with the Dart float system. Technically what a disaster. A fuel selector not well guarded, harnesses that are difficult to release and floats that didn't work. Plenty of room for improvement.